Burgfarrnbach can no longer be walked on in its entirety for there is a highway cutting through this formerly beautiful lane. I need to admit that I dreamed about this alley lately. 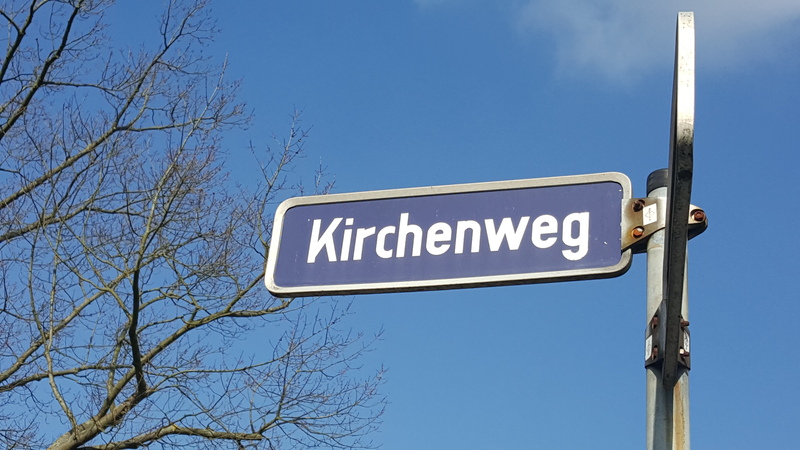 However, in my dream I had no idea which street the Lord wanted to show me. 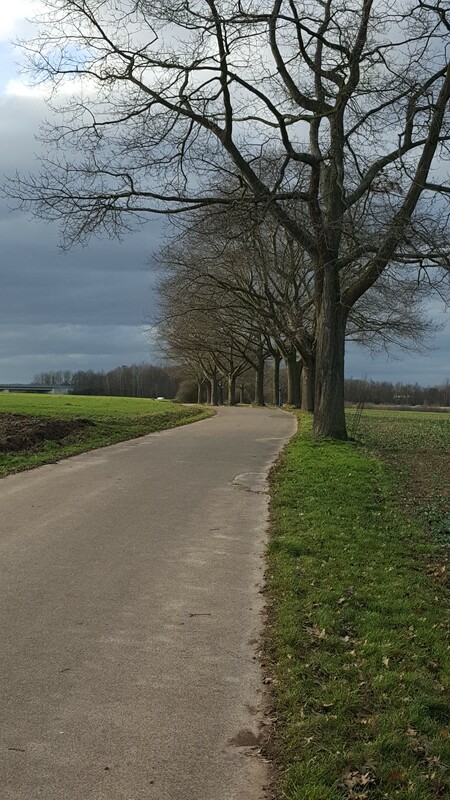 But two days later as I was on a bike ride around there, I felt that God wanted me to ride this path and no other. I think it was only the second time in my life that I did so since, honestly, who would ever tread on a path, beautiful or not, and follow a road if they knew it was a dead-end street? Well, on that day I followed God’s sometimes quite humorous leading and took a few photos although I was not yet sure what to do with them eventually. Just today I felt drawn toward this alley again and took more pictures. Afterwards as I continued on my biking tour, I saw that those paths I usually ride on were inaccessible because of forest work. Hmm… Didn’t the Lord lately tell me that He wanted to show me another way? If He says such things and you ask Him what He meant, you rarely get a sudden reply. Sometimes you can take it literally, sometimes you need an interpretation only the Holy Spirit can provide. And sometimes, it is both. You can take His words literally and later the deeper meaning will be brought to light, too. Back to my bike ride. It was rather cold today, but the muddy path God led me went uphill through the woods and so it got warmer quickly. All of a sudden, I felt I had to stop again and take more pics. God is so funny!! 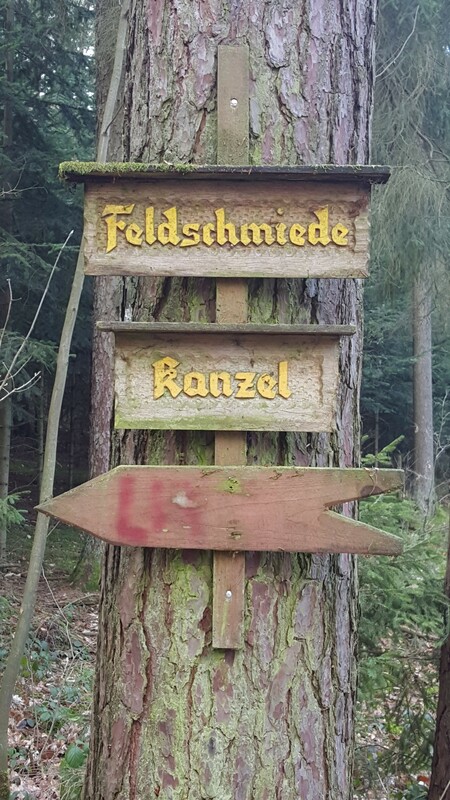 I saw three wooden signs on a tree of which the second one in the middle said “Kanzel” which means “pulpit” in English. Hahaha!! XD At first God confirmed that the way of the church was a dead-end street and then he pointed me to a pulpit in the middle of the woods… Very funny, indeed! Yet that was not all. In order to prepare you for the next sign I saw, I need to go back in time two days again. In the late morning of Wednesday I hurried to the registry office in Fürth in order to renew my ID card. We need to do this every ten years and so I grabbed my new passport pics [you know those biometric photos that bear a striking resemblance to mug shots – wink wink] and left on my bike. Due to an inflammation in my left foot, I had to quit walking lately and so you will find me almost daily with wheels “beneath my feet.” Well, I often find myself in a hurry even if there is no need to feel that way, but although I always tried hard, I could not change that. As I had finally arrived at the second floor hallway of the registry, I saw that it was almost empty. To my amazement there was only one woman who was waiting. Unusual, even this. I felt already relieved as I stood in front of the touch screen display where I ordered my turn ticket. “Lo and behold! 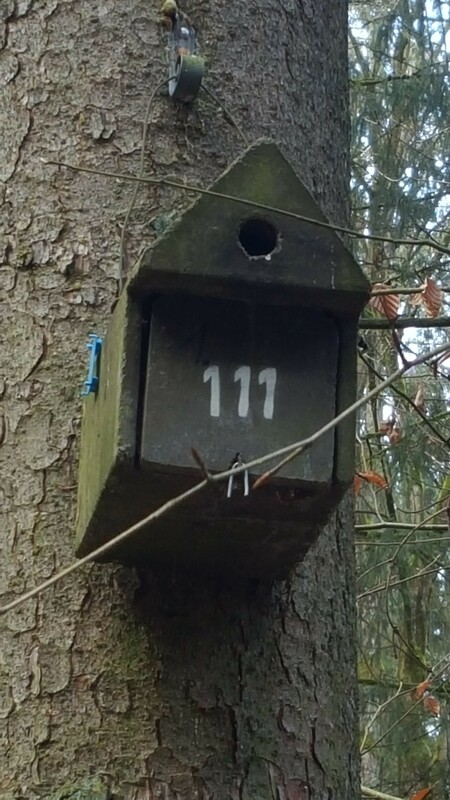 !” Hahahaha… Susanne got # 111! 🙂 I really had to grin as I sat down in a chair. But nooo!! Even after only one minute, I saw on another screen that # 111 was called to come to counter # 1. Big grin… In a funny mood I entered and had a great time with that friendly and pretty young woman behind the counter. Leaving the registry again, I thought I could at least ride a bit more on my bike. Although it was chillingly cold, I pondered that lunch would taste better after some more kilometers. As I was still thinking about God’s humor and about how he took my feeling of being stressed completely away by providing # 111 for me, my glance lighted on the top of a big tree. Oops!! What was this? This was a wonderful blog. What a “coincidence” that “The Way of the Churches” would be a dead-end street! You wrote, “Honestly, who would ever tread on a path, beautiful or not, and follow a road if they knew it was as dead-end street?” Sad to say, it is done by millions today who still seek after God in the highly visible, beautiful kingdoms of men called “churches.” Did not Jesus say, “The kingdom of God cometh not with observation: neither shall they say, Lo, here! or, There! for lo, the kingdom of God is within you.” (Luke 17:20-21, ASV)? Only that kingdom that God has built within us by HIS Spirit will remain and survive this final shaking that is upon us. All our attempts to hold our outward worldly lives and institutions together, to leave a legacy, will be for not. The more we hang onto them and seek to save them, the greater will be our loss, FOR OUR GOD IS A CONSUMING FIRE! Why do we keep pursuing the fallen ways of Cain of building cities when our example is so clearly the faith walk of Abraham? Thank you, dear Susanne, for sharing your heart and the things Father shows you on your great adventure of walking by faith. Once in a while He gives me a physical thing to speak to me like the day I was praying while sitting on a big rock down at the lake and looked down and saw a heart shaped rock between my feet with which he told me to keep pursuing the path I was on — His great love for the saints of God. Our fellowship is truly a blessing to me and your example of faith and honesty in the midst of trials has been a shining light. I think God had a plan in mind when He put you an me together since what He shows us is almost always complementary. Indeed, I cannot count how often I told you about my dreams, visions, or what the Lord would teach or tell me and you immediately came up with the proper Scriptures. That is truly amazing and has been very helpful for me! ⭐ I am glad you called it a positive trigger above. 🙂 Thank you very much, my dear brother! This is so sadly true and so pointedly stated. What grieves me the most is that whether it is an ideology perpetuated behind the suit and pulpit, or whether reinforced by the unbiblical “laity”…the bottom line is that man wants this system. How it grieves our Lord’s heart to have a people redeemed and called to His own heart, but instead gather to find value and worth somewhere else instead. I am so blessed to have this family to glean from. thank you guys. I think I had misunderstood some of the passages you mentioned above. So thank you. I like what you said there, David. When I started going to “Church” I thought that was what GOD wanted me to do as I was woken up one Sunday morning. Although I felt farther from GOD in “church” I feel closer to him at home out side listening to his word. Because it is nice out I got to do that just a little bit ago. The snow is melting and it is so nice out that I was able to sit and or walk around the house and listen to his word and a Christian book. The people reject God today just as they did in the time of Samuel for all the same reasons. They want a king to rule over them and to fight their spiritual battle for them, and to do all the “God stuff” for them so they don’t have to. And God still sees it as rejection of Himself by them for He wants no other mediator between Him and man other than His Son. Wow that is a cute story–I love it when you say Father is [funny] and yes indeed I believe He is but what else can you expect when He has to deal with a silly bunch like us! The Lord is so wonderful that way, and really, “the heavens declare the glory of God” – why then shouldn’t see little signs of God everywhere we look? Sometimes it’s as if He likes to play “peek-a-boo” with us or “hide-n-seek” and why not, if we come to Him like our Father and we are like little children? Of all the messages He has given me over the years, the most consistent one would seem to be “remember to be childlike, enjoy Me and have fun” … a most difficult message to remember, when all our sophisticated adult understanding is going up in flames. I love that when things get too serious, He’s there waiting to spring out with a “Boo!” to remind me what it’s all about. I think a pulpit belongs in the woods…then the earth joins the heavens in declaring his glory! It does not get any better than this! You and I are ONE in Christ, one in our Father, one in Jesus, and one in the Spirit of Christ. We are no longer of our independent fallen former Adam natures, but if any man or woman be IN Christ they are a NEW creation. You are a tremendous blessing to us all, dear sister as you speak from the unity you have IN Christ! ❤ Thank you so much. I remember that those three ravens were sitting side by side like three “ones” (digits), but not necessarily on the same branch. However, they were rather close to one another which made me wonder, too, since it is unusual. From the first time as I had seen the turn ticket with # 111, I felt that God wanted to tell me something. As I later saw those three ravens as if they were a black “natural number” above the earth, I felt God speaking to my heart that the Oneness of the Trinity belonged to me. That touched me deeply!! And then the confirmation and second witness in the woods as I discovered the bird house yesterday. I feel so humbled! Thank you for this. I needed to see this side of GOD. Sounds delightful and fun. And yes I know Our Father has a great sense of humor. I have a story about a raven from years ago. At first I thought he was going to eat my donuts when I was returning to the picnic table so I chased him off. But then I became embarrassed because I saw that he left some bread of his own. Ooops. The message I got back then was Walk by faith and not by sight. Pretty neat story Susanne. Thanks for the smile. Maybe, God does not take away from you what you really like. Instead, He offers to feed you from heaven with His Bread which is Christ. Which is interesting that you said that because I had a cup of donut holes with a lid, a bible and coffee on the picnic table. I walked away to walk and talk with God along the shore. I was on Picnic Island. Walking back I saw a crow or raven near my donuts. I ran and the bird flew away because I didn’t want to my donuts gone. (laughing now about it). And my bible was right there too. He was eating his own bread. But left the crumbs. I had to apologize for my lack of faith. Even before my first reply as I thought of 111, I thought what does psalm 111 say? So I just now looked it up and sounds pretty good to me. Here it is. Yes, very unusual for a raven to leave you food instead of taking it. Elijah also had this happen (see 1 Kings 17:2-6). Elijah was alone and persecuted at that time by the wicked queen of Israel, Jezebel, and God hid him and fed him for 3 1/2 years, miraculously during a famine in the land. God bless you, sister! Thank you Michael. I had thought about that too when it happened. Today I feel strongly that Our Father will take care of me no matter what circumstances I find myself in. I am going back to NC in less than a week. We have talked before about something specific about living arrangements and whether or not I thought it might be wrong to lean on that or not. Well it turned out that I couldn’t even get it tho I qualified. I am glad because than for sure I would have been stuck. God is good like that tho I don’t see it at the time. Where I am going will be more convenient since I do not have a car. And EVERYTHING will be within walking distance including the bus stop. (chuckle) And my little girls can come see me and we’ll get a hotel room and rent a car and go visit the mountains. Oh what joy that will be! I agree! I hope so too. If I had not met you 3 I would probably be still going to “Church” and feeling farther and farther from GOD. Thank you very much. Fred, your comment about going to church and feeling further and further from God reminds me of a quote from Lenny Bruce, “Every day people are straying away from the church and going back to God.” You are not alone, my brother! I am especially happy Michael that you found me! Through Ruthie, then came you and I thought? Hmmm… who is this person liking all my posts? So I had to find out and lo and behold through you came Susanne, and I was marveled at the fact that finally I understood the language of all that I have endured and didn’t understand why as to where all churches and nut doctors could not tell me but you were divinely inspired by the Holy Spirit to teach me as I was very open to understand. And I said YES!!! I understand this language!!!! Then came Fred and felt him reaching out to search for truth and he has stayed along with us. Then I met Funny Jack and we are just one big happy and yet still following the path to truth. Each of us on different levels of understanding. But I do admit that Michael and Susanne you really do have a sense of harmony when you write and so well put. I am sad a little for leaving here in a few days from Florida but am happy to move on too. I am so thankful I don’t have much material baggage to lug around. LOL And let’s not forget Anne! My dream of Isaiah 43 from about 20 yrs ago has and is coming to pass. There are many more to come into the fold!!!! Doesn’t matter. This is a very edifying experience for me and countless others. I am happy to hear that, Stacey. I’m glad God connected the three of us, Stacey. Good to hear that things are shaping up for your move to N.C. Bless you!